Guinness has launched a campaign in the US to save St Patrtick's Day as an official holiday. Its nice to know that they are so public spirited and aren't attempting to exploit this opportunity for marketing purposes. 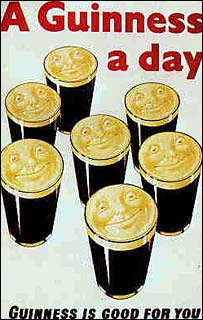 Here in Ireland (North and South) its a public holiday (17 March).....and a great one at that. I have had many great times on St Paddy's day, been to New York twice and stood freezing to watch the parade. If you get a chance the parade in Baile átha Cliath is great craic too. Good family fun. The BBC has more here on proposition317. You can sign the petition on-line here.